The last semester we were involved in a project that tried to connect literature – written knowledge – with architecture. Of course, knowledge has been transmitted until very recently or until now by books, by letters, by printed forms invented in the Renaissance. So, the fact that books have been our instruments to transmit, to diffuse and to produce knowledge is something that we all know. Architecture in certain moments through its history has played an important role in this fact. The library has been a monument of the Enlightenment – encapsulated for instance in the project of Étienne-Louis Boullée from the French Revolution – meeting the idea that the new „religion“ is reason; a reason connected to knowledge without mythical or other kind of limits. 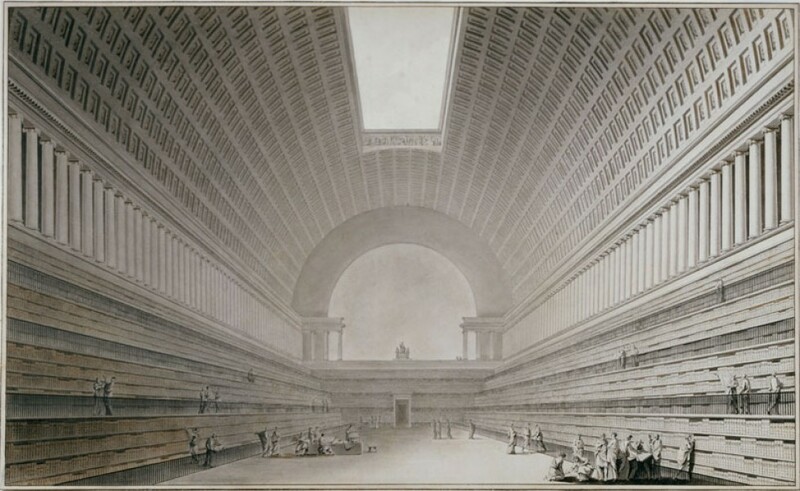 One of the most important projects of Boullée was a big library – the big library as a new temple. This idea of the library as a temple – the temple of knowledge – has been gravitating into our times, as one sees it for example in the work of Gunnar Asplund or Louis Kahn. We were confronted to this argument. The results proofed to me that knowledge today is distributed in many other ways. The space and the content at the end, even it was full of exciting arguments like Elias Canetti – his shadows, connected to Zurich and books – were an important principal connection, but difficult to manifest without creating a kind of caricature. Italo Calvino – in one of his late books, the Six Memos for the Next Millenium – announed the present loss of weight of things. With the books loosing their weight, in parallel also the library gets lighter: the buildings for books are not really buildings for books anymore. Loosing any kind of monumentality and specificity, they transform into more abstract, civil and vulgar places. In sum, they are not representing a certain temple-idea anymore, but are more closely related to a kind of supermarket-idea. Even, if in terms of content our work was confronted to this kind of of loss of weight, loss of tectonicity of the parts, things, or colours of the contemporary life, what appears again as one of the key moments, and one that architects are still dealing with, is the place. Many people, for instance, Aldo van Eyck have said that “whatever space and time mean, place and occasion mean more.“ Our site in Zurich was very singular, very local, very particular, and in a way surrealilsticly enhanced – a garden at the top of the roofs of the houses and in front the city, the lake and the mountains. This kind of dialectic between place and project is perhaps one of the most exciting problems an architect can deal with today.